Cream together oil and sugar. Add carrots, flour, 4 egg whites (slightly beaten) and cinnamon. Add pecans. Fold in 4 egg whites (stiffly beaten). Pour in ungreased pans and bake at 375° for 35 minutes. Use cream cheese icing on top. 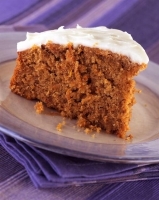 Recipe categories: Desserts, Cakes, Carrots.